Apart: If you could describe what Projekt was in one sentence, what would you say? [Dela] It was a vision of pulling like-minded veteran promoters together for an event production ‘project’ that offered something unique and fresh (in various facets) to a city, whom at the time seemed to be searching for something new… both musically and aesthetically. [Screendoor] Projekt was a collective group of great friends (who also happened to be promoters) that all aspired to create one-of-a-kind, underground and magical events for the electronic scene in Milwaukee, with no expense spared. [Sir Fice] Projekt was a collaborative effort between like-minded individuals that combined knowledge and experience to create a unique event and share the music we’re most passionate about with our peers, at the highest level of quality possible. [Fortune] Future Forward Music with a concept and promotions to match. Apart: What was your initial reaction when first introduced to the initial concept of ‘Projekt’? [Fortune] “Yes! Count me in.” This was a rare opportunity to work with 3 established and respected music mavens in the community, all with unique strengths and appeal. The idea of bringing our 4 minds and niches together, to grow something special, fresh and needed in our music community was exciting to say the least; an instant Must-Do! [Sir Fice] At the time, I was on a hiatus from promoting after a 3 year stint of running my weekly show (HomeBrew) to focus on family, as we welcomed my son into our family. The itch to do shows never left, and I remember being very enthusiastic about whatever it is that Brad might have in mind for this meeting he called between fellow promoters in Milwaukee. The idea behind Projekt was so good, and the people involved had so much experience and a similar drive to push music forward in Milwaukee that it had to be jumped on immediately. [Screendoor] I was humbled to be brought on board. I had been doing solo ‘minimal-esque’ shows for a few years prior with little to some success. I was also a huge proponent of the sound and kept it in stock heavily at my vintage clothing/vinyl retail outlet ‘Niche’. Being involved with the Projekt crew brought the attention to a style of music I was supporting to a much broader audience and was a dream come true. [Dela] Well, it was my vision after returning from a stint in Europe during the summer of 2007 for SONAR Festival. I came home with a ton of inspiration. 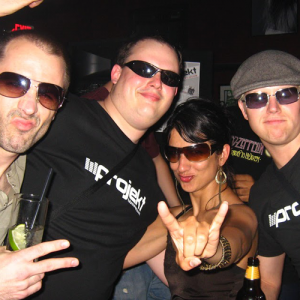 I fell in love, not only with the Minimal Tech sound that was en vogue all over Europe at the time but also with the type of experiences that my hometown was lacking when going out to hear dance music. Just like the rest of my fellow scenesters in Milwaukee I was looking for something new. I found it in Europe and wanted to bring it home to share with everyone. So I sought out 3 experienced partners whom each had very different yet very strong skills that I knew would successfully drive this vision. Apart: Projekt was short-lived (only around 3 years tops), but what do you think made it have such an impact on Milwaukee’s underground dance scene? [Dela] I think it was just that our #1 goal was to be the antithesis of what was already happening in Milwaukee. We wanted EVERYTHING to be a brand-new experience. From the venue, to the musical platform, to the bookings, to the promotions… EVERYTHING. This was very important to us. Externally, we worked really hard to have a polished look with everything we did. We liked to engage in really creative Marketing practices that left a mark on people’s memories… and internally we really wanted to make sure that we were as professional as possible with the artists and agencies we were dealing with so that we also impressed the industry-side of things. Lastly, I think when people look back at the type of artists we were bringing in, again with a goal of all being brand-new and cutting-edge to the city, they see how we really did mean what our tag said: ‘Future.Forward.Musik’. To think that we had people like Maceo Plex, Drumcell, and Dustin Zahn sleeping on our couches back then, whom are now all completely untouchable around here is pretty amazing. And I think all of that put together is what exponentially granted us the ability to do such high-caliber shows that people continue to remember. [Screendoor] Good timing. Electronic music tastes were in transition; digital was just gaining steam, the underground focused clubs were all closing. Projekt utilized effective guerilla marketing tactics to inspire the club kids that were into the music to keep pushing for underground nights at new venues without selling out. We were able to keep the momentum and vibe of the old school and start inspiring the new scene. [Sir Fice] The timing was right for something new in Milwaukee, and people were eagerly awaiting whatever it was to show its face. Having the team we did, with so much experience and knowledge in different facets of event promotion and marketing, allowed us to provide a unique, professional, and most of all a high quality experience in everything we did, from marketing to event production. Simply put, people trusted Projekt as a brand, and knew that they could expect fresh ideas, top tier event production, and world class music right in our own backyard. [Fortune] The most successful collaborations tend to be when each individual brings a unique contribution to the table and actively participates. We were all established, invested, excited and experienced, but had a unique reach and strength And we all share an genuine passion for a certain sector of dance music. And Milwaukee was ready, needing something.. The timing was immaculate! Apart: What was your favorite Projekt show? [Screendoor] Toughest question here. Tough to choose one. Our first all night warehouse undergrounder with JPLS and Skoozbot had the most intimate, big rave feeling and probably was the highlight for me. Although, tt was also a big honor hosting Richie Hawtin at Turner Hall. Doing a side room at the Accelerator camp out rave in Minneapolis was a total blast too. There is also the great feeling of supporting, booking and meeting so many of the underground elite of the US national scene like Maetrik, Acid Circus, Skoozbot, JPLS, Pezzner the list goes on…Each experience was amazing as I felt we kept pushing the boundaries and kept trying to take things to a new level. It was tough ending things. [Dela] I am going to cheat, sort of, and offer 3 (of varying types of shows we did). My favorite show from our monthly club night was probably the Maetrik show (aka Maceo Plex). I don’t think I’ve ever flipped out at my own show the way I did that night. My favorite undergrounder was our Warehouse Party featuring the Minus boys, and of course, our big room show at Turner Hall hosting Richie Hawtin and Gaiser also has to make the list. [FORTUNE] I can’t pick one, but Acid Circus, Maetrik, Kyle Geiger… They are mostly a blur of awesome. Apart: Projekt utilized a unique promotional style. What was one campaign that sticks out to you? [Sir Fice] Hands down that has to be our initial campaign launch which introduced Projekt into the wild and lead up to our first show. No one had any idea clue about Projekt. That anonymity allowed us to carefully craft an experience that was brand new, and it excited people. Stickers with just a logo. A social blast including nothing but our logo and a date. A small trickle of additional information every few days to increase curiosity and stir people into a frenzy. Everyone ate it up and it lead to an explosively successful initial offering in our venture. The attention to detail and marketing prowess we poured into that campaign was astounding, and set a precedent for all things Projekt moving forward. [Dela] Yes, I think it was our launch campaign back in January of 2008. We first started out by creating stickers with just our logo on it and smacking them EVERYWHERE. At shows, on people’s backs, everywhere. With zero explanations. Then we followed that up with hitting message boards and Myspace with just the logo and the date of our debut party. Still remained quiet. People where DYING trying to figure out what the hell it all meant. It spread like wildfire. And then every 3 days or so leading up to our first party we would reveal a little something new on what we’d be offering (the Drumcode logo for example), until the full reveal. It was amazing seeing it all fall into place. And the best part is we didn’t stop there. Every new project had a new campaign around it that we would spend hours hashing out privately beforehand. I quite miss it. [FORTUNE] The innovative and interactive approach that Dela initiated with promotions stood out, for example giving guests a code to enter online and receive a download for an upcoming artist’s mix. [Screendoor] The Richie Hawtin cardboard heads glued on sticks at the Accelerator camp out. Apart: Sir Fice, on top of being a DJ, you were Projekt’s creative director. Did that role have any influence on your professional career as a design artist? If so, how? [Sir Fice] Absolutely. Projekt demanded a lot from me in regards to design, web development, branding, and marketing. That accounted for plenty of long nights learning new technologies, learning loads of marketing tricks from Brad’s expertise, scheming on new ideas to keep the brand fresh, and putting lots more notches in my design belt. I’d only ever done design/web dev as a hobby, mostly to support the music I loved, but by the time Projekt was nearing its end I had the skill set and passion to pursue it professionally, and still use the tricks I learned along the way on a daily basis. If it wasn’t for Projekt, I’m not sure I’d be doing what I do today. Apart: Fortune, your own For U Events project was already very successful and well-under way, however did you feel your involvement with Projekt influenced your future promotional efforts at all (perhaps with projects like Apart, etc)? If so, how? [FORTUNE] Other than learning so much about collaborations, team dynamics, audience trends and attention spans, one big takeaway that continues to impact my work today could be summed up as brand quality and promotions strategy . Brad is a marketing pro, and his polished approach opened my eyes to seeking out the future forward standard, rather than the standard. Until then “book a show, make fliers, post on message boards” flow is what myself and Milwaukee was used to. Projekt developed themed concepts on paper from start to finish, with our own creative director, integrated innovative online development, and embraced the mind set of being 3 steps beyond what everyone else was doing. A priceless experience. Apart: Screendoor, you have always been known as one of Milwaukee’s well-kept aficionadoes of ‘forward-thinking’ electronic music. Do you feel this had an impact on Projekt’s sound design? [Screendoor] To be honest, not really. I had been well into ‘minimal’ by the time of my introduction to the group having hosted shows with Bruno Pronsato, Geoff White, Barem and helping support other local/Madison shows. The forward thinking kids in Milwaukee had finally caught up to me! It was great to finally collaborate with other like-minded artists who each had their own interpretation of the minimal sound. Dela was always into the minimal, bouncy techy house groovers. Fortune was always a bit more on the house end, with some chunky bass end Dirtybird style (before the DB sound was even defined). Sir Fice bridged his harder techno upbringing with the more minimal stuff but it was always a bit more uptempo, and always more industrial and more ‘pure’ techno. At this time I was already well into Dubstep and throwing more bass heavy style shows. If anything, Projekt helped me focus my tastes for a more extended period of time before I jumped ship totally into even another esoteric genre. Apart: Dela, today you are in the forefront of the global underground tech industry, both as Paco Osuna’s label partner with Mindshake Records, but also as a producer and touring DJ. Did Projekt play a role in that career path at all, and if so, how? [Dela] It undoubtedly did… where I am now has EVERYTHING to do with Projekt. I remember the day vividly after about 2 years into our success with Projekt sitting in Screendoor’s living room on a Saturday afternoon telling him that my vision for us became 3-dimensional and much beyond a Milwaukee-based production group. I wanted to use the success we had locally and the very reputable promotional style we used to have an impact on a much broader National scale. It birthed the idea of transforming Projekt into an internationally-reaching Marketing & PR firm that assisted labels, artists, and much bigger promoters with their releases, tours, and large-scale events respectively throughout the US. We saw immediate success with this venture as we were one-of-a-kind in the industry. After befriending Spain’s Paco Osuna some years before via our Minus contacts we had booked at various Projekt shows, Paco approached me and my Projekt team to do a creative promo idea for his next US Tour. He loved the finished product. He then officially brought me onto the label in 2010 to wake it up from a slumber using the Marketing strategies I was armed with, and eventually that led to becoming a full partner of his with the label. This, in turn – with a whole lot of dedication on my own end, heavily catapulted my career on the DJ and Production side of things… and the rest is history. Join PROJEKT Friday November 1, 2013 @ Studio 200 with Daniel Bell.